The Sheriff's department cannot utilize criminal investigative tactics such as stakeouts or computer inquiries (DMV, arrest records, etc.) to serve process, therefore they cannot guarantee service. The professional process server can utilize many databases to obtain many places in which an individual might be located. The judgements issued by courts are valid statewide, however the deputy sheriff's office is limited to the county in which they are deputized. The professional process server is acting in the capacity as a court officer which gives him the rights to serve legal documents anywhere in the state or nationwide where they are legally authorized. The Deputy Sheriff arrives in a marked car wearing his uniform while the process server arrives in plain clothes even jeans and t-shirt. He/she might be aware of impending service of legal papers and remain ellusive to anyone in uniform. If any actions are taken against someone in a court of law, he or she must be notified of the fact under US law. Process service is the way that he or she is notified. 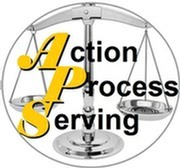 Service of process or process serving is a key part of what is known as the “Due Process of Law”. An APS professional process server will find this person and hand deliver court documents to them so that they are fully informed. Depending on the court case one is involved in, a process server may deliver subpoenas, summons, complaints, order to show cause, or writs. Each state has its own process serving laws and rules that govern civil procedure. The Process Server must follow these laws and regulations legally to deliver these court documents. Usually, a process server must deliver documents to someone by hand. In this legal process of service, court documents are left with management personnel at someone’s place of business or are left with an adult resident of someone’s home.